Home » Baseball » The Sports Illustrated cover jinx is dead!!! The Sports Illustrated cover jinx is dead!!! 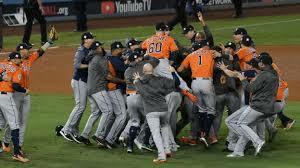 In case you just woke up after falling asleep early last night, the Houston Astros have won the 2017 World Series in Seven games over the Los Angeles Dodgers. I had said earlier this week, that this series was really fun to watch for fans that have no dogs in the fight, but Game 7 of this series was a major letdown. A win is a win and for the Astros last night completed the plan that they made five years ago and every other team in the MLB should follow the Astros’ blue print. This first six games of this series were obviously split between the two teams which forced a Game 7, but none of the games were blowouts because the pitching on both sides had its struggles at times during this series. Even though the Astros had basically won the game in the first inning last night, most baseball fans still kept watching the game knowing that the Dodgers will eventually get back in this game. The Dodgers were never able to find the groove in the biggest game of the season and went down quietly into the dark for the next five months. The Dodgers have the highest payroll in baseball and were the best regular season team this year so losing this game is a letdown for them. Most teams in the MLB would consider losing Game 7 of the World Series as an overall successful season, but for the Dodgers this season was another disappointment. You cannot be one of the best regular season teams of all time and have one of the best pitchers of all time in Clayton Kershaw and have a World Series drought of close to thirty years. Kershaw has been heavily criticized for his really bad performance in the postseason and had a chance to get that monkey off his back but failed to do so this series. He was phenomenal in Game 1 of this series before completely pooping the bed in Game 5 and even though he did not give up a run in his relief effort in Game 7, he needed the Dodgers to win the game to change his legacy. Kershaw is going to end as one of the five best pitchers in the long history of MLB, but will always be referred to as a great regular season pitcher and a terrible postseason until he has that great run in the postseason. The Dodgers and the Astros had different strategies to get the World Series, the Dodgers used their big pockets while the Astros used their big brains. The Dodgers paid a lot of money to their impact players while having a small core as opposed to the Astros having a really good core of players and going out and getting the last few pieces to finish the puzzle. Neither way is considered wrong but it seems as if the Astros’ way is more sustainable than the Dodgers’. The Astros were the worst team in baseball in the early parts of this decade and were acquiring a lot of unproven minor league prospects in exchange for their major league talent. The Astros had a five year plan in mind that a rebuilding teams try, but they stuck to their plan and were rewarded with a championship to officially end their rebuilding plan. No wonder why Sports Illustrated predicted that the Astros will win the 2017 World Series way back in 2013 because they had a plan that was well thought out and going to work. The Astros have a great core of players that are going to be with the team for many years to come and are just entering their core, so the Astros are going to be a formidable force in the American League for the next few years. Even though they had a great core of players that got to the postseason in 2015, they were still missing a few pieces that would take them over the edge. After a rough 2016, the Astros went back to the drawing board and figured all the pieces they needed in order to win the World Series. The Astros had an abundant of talent in the minor leagues that they could now use to exchange for talent on their major league roster. In the off season, they went out and got Brian McCann from the Yankees to fill the hole at catcher and signed Carlos Beltran in free agency to add another impact bat in the lineup and allow one of the greatest postseason players of all time as a mentor to the young core of talent. The Astros came out firing in the first half of the season and were the best team in the American League. It seemed like they had hit a wall in the middle of the season and instead waiting for the wall to go away, the Astros went out and acquired Justin Verlander in August as the final piece to get them over the wall. Verlander was great for the Astros and only lost one game in Astros uniform, which was Game 6 of the World Series, but saved them by winning an elimination game in Game 6 of the ALCS against my beloved New York Yankees. The Astros have been the biggest thorn to the Yankees side in the past few years as both teams were rebuilding but I am still in awe of what they accomplished. Even though I do not really like any players on the roster, I am still happy for the people of Houston especially after the devastation caused by Hurricane Harvey. The Yankees had a very different blueprint than the Astros in terms of the rebuilding process, but both teams are peaking at the same time and are going to be battling for the American League pennant for the next few years. Well that concludes the 2017 baseball season, it was my first full season as a blogger and I really enjoyed it this summer. I do not have a plan yet in terms of baseball related content in the off season but it is still my favorite sport and if something major happens I will have it blogged. I will probably have some blogs when Free Agency really gets going and when the Winter Meetings roll around but I cannot wait to write my previews for the 2018 season next spring.